When I think of pasta and peas together, I think of blue box macaroni with a can of tuna and a can or bag of frozen peas. Well, that’s what I thought about pasta and peas before I really learned how to cook. The fun of cooking comes with exploring with flavors, textures and tossing together new ingredients. I’m always on the hunt for new favorite recipes…especially for lunch. And while this could definitely be dinner…it would make for a great pasta for lunch…and it would keep well in the fridge for leftovers. I’m loving the ham, peas, lemon, Parmesan and dill flavors together in this one!!! Cook the pasta as directed. Drain and don’t rinse. Return pasta to the pan it was cooked in, or into a serving bowl. Toss the diced ham and the cooked peas with the pasta. In a small mixing bowl, whisk together the olive oil, lemon juice, lemon zest, vinegar, dill along with some salt and pepper. Pour it over the pasta and toss. 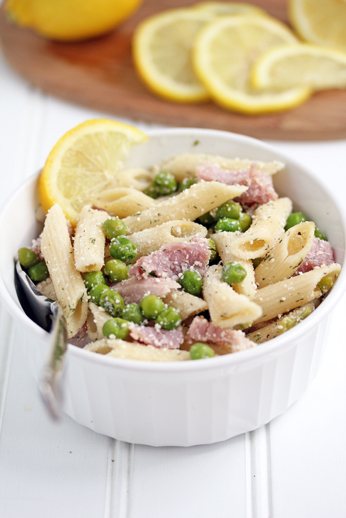 Serve Lemon Pasta with Ham and Peas with garlic bread.